Forensic anthropology is a sub-field of anthropology. Here biological anthropology is applied to the legal field. 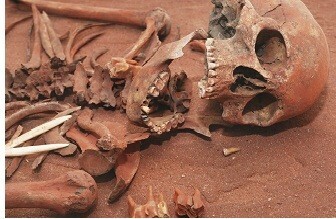 Anthropologists who specialize in the area of forensics generally focus on human skeleton and bones. Many television shows and films have introduced this field to the masses and have presented it in a highly glamorized way. Thus, an increasing number of anthropology students have become interested in pursuing forensic anthropology. However, education is necessary to become a forensic anthropologist. To enter the field, students need to have a master’s or doctorate degree in biological or physical anthropology. Only a few job opportunities are available in forensic anthropology for individuals with a bachelor’s degree. Most forensic anthropologists find jobs in academic or research institutions and when there is a need they also provide consultation on cases. Some forensic anthropologists also work in the armed forces and medical examiner’s offices. They may also work for non government organizations, where they work in teams that investigate war crimes such as mass graves. Only a few people are employed in forensic anthropology on a full time basis. Students aiming for a career in forensic anthropology need to enroll in fully accredited schools and programs. Many jobs in the field require individuals who have a PhD degree. Anthropologists with a master’s degree can find work in laboratories. However, they also need a PhD degree to advance in their career. The time taken to complete forensic anthropology degrees vary, but a bachelor’s degree normally takes four years to complete if students attend a full time school. A master’s degree generally takes two years to complete, while a PhD degree takes five years or more. A common pathway for students interested in forensic anthropology is to get a bachelor’s and a master’s degree, and then acquire further education with a doctoral degree. After a PhD, many anthropologists prefer to get certification. The American Board of Forensic Anthropology (ABFA) offers a number of certifications. A certification in forensic anthropology may give individuals their desired employment and demonstrate their expertise in a particular area. In order to become a forensic anthropologist, students will have to take a variety of courses. Major courses in the field include biochemistry, chemistry, biology, field archaeology, and forensic anthropology. Courses in a master’s degree are much more challenging than the ones offered in a bachelor’s degree in forensic anthropology. Students may also be required to complete courses such as organic chemistry, anatomy and physiology, and microbiology. As forensic anthropologists have to frequently work on skeletons and bones, it is crucial for them to take courses related to osteology. Forensic anthropology programs are not completely offered online. There are always some courses that require practical experience and lab work. However, taking some courses online can be useful for students who need flexibility in their study schedule. Working students and professionals can also opt for a hybrid program to make further education possible in the field. Some courses in forensic anthropology offered online may include pharmacology, basic forensic anthropology, osteology, toxicology, and crime scene protection. Since these courses do not always need lab work, they may easily be completed online, without having to visit a campus. However, most forensic anthropology programs are completed on campus, as professionals in the field require a lot of field experience and lab work. Accreditation is a crucial factor to consider for those individuals who are interested in studying forensic anthropology. While searching for an anthropology school, prospective students would need to make sure whether the degree program is accredited by a recognized accredited agency. Many accrediting bodies are actively involved in checking whether the forensic anthropology schools are meeting the desired standards. Two major accrediting agencies that ensure quality of curriculum, teaching methods, and faculty at forensic anthropology schools include American Board of Forensic Anthropology (ABFA) and the American Academy of Forensic Sciences (AAFS). Accreditation is important for students as it can greatly affect the quality of education they receive and their future employment prospects. Forensic anthropologists work with other professionals such as homicide investigators and odontologists to identify a dead body. They also look for evidence of criminal action and conduct post mortem of the bodies. Besides identifying suspicious activity, forensic anthropologists work to find out the age, gender, height, lineage, and some distinguishing features of a deceased person by working on the skeleton. The research on skeletons is normally done to confirm some evidence or to support the statement of other experts. Lawyers have to rely on forensic anthropological evidence to support their case. Generally, bones are not taken to the courtroom as evidence. Instead, various experts of the field are invited to provide testimony. Police may also need to take help from forensic anthropologists when a facial reconstruction is required of a deceased person. According to the Bureau of Labor Statistics (BLS), the employment of archaeologists and anthropologists is likely to grow at a rate of 19 percent between the years 2012 and 2022, which is much higher than the average growth rate of all occupations. However, forensic anthropology is not a very wide ranging field and the fast growth may only lead to around 1400 new jobs over the next ten years. It is also likely that jobs in forensic anthropology will be highly competitive, as it is only a part of the larger profession. Besides, the turnover rate for forensic anthropologists is quite low and people having these jobs tend to stay much longer in this profession. The median annual salary for archaeologists and anthropologists was $57,420 in May 2012. Individuals who are interested to know about job opportunities in the field of forensic anthropology should contact professional organizations such as The American Board of Forensic Anthropology and American Academy of Forensic Sciences. These professional organizations provide information and professionals can also join these organizations. Q:What courses will you study as part of a forensic anthropology degree? A:As part of a forensic anthropology degree, you will study a variety of courses that will help you identify the remains of human beings by determining the gender, stature, age and ethnic background. You will be exposed to topics such as forensic anthropology techniques, forensic anthropology procedures, osteology, anatomy, water and soil sciences, zooarchaeology and genetic variation and human evolution.